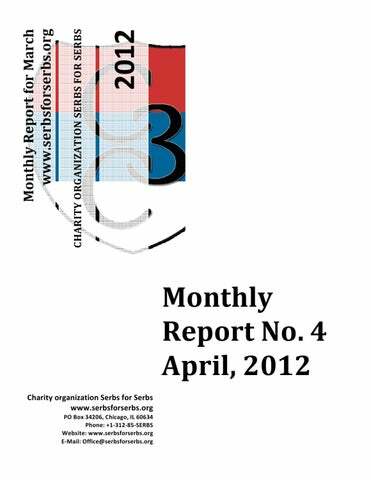 Monthly Report for March Dear friends and donors, Charity organization Serbs for Serb Serbs registered in the state of Illinois in United States in Jun 2010 by the group of the Serbian youth. Charity organization Serbs for Serbs is a 501(c)(3) notfor-profit charitable organization. Donation is tax-deductible deductible to the extent followed by the law. On 30th September, 2011 we finally got the letter from department of the treasury (IRS) with tax exempt 501(c)3 approval. All donations to our organization donated from June 16, 2010 are tax deductible under section 170 of the Code. We are also qualified to receive tax deductible bequests, devises, transfers of gifts under section 2055, 2106 or 2522 of the Code. www.serbsforserbs.org 2012 the population and generally bad economic condition of the households in Serbia, Republic of Srpska and other countries in the Balkan. An average couple has "fallen" on one child. Analysts warn that Serbs will become a minority in its own country in the following century if the nation, individuals and government don't wake up from the nescient in which they've fallen! On the other hand, nobody is talking about the families with many children which grieve by living in bitter poverty. Occupied by their everyday struggle for survival, they are being humbly in their desire for implementing rights which belong to them. Their life stories, fears and problems are identical, but almost invisible and unheard in order to gain the attention of the public, media and even state. That's why the idea of the Charity organization Serbs for Serbs arose. The organization rganization was formed by a group gr of young and trustful people, who are united by the common vision of helping families blessed by many children and who are aware of the fact that even a small help means a lot for those who don't live in a material excess. We are united by the humane idea to help the poorest part of the Serbian nation. Charity organization Serbs for Serbs try to revive the spiritless energy of the Serbian Diaspora which would be able to reinforce people of Serbian heritage as well as all good people throughout the world ld with minimal, but bu constant monthly donations. We hope and believe that there is also a grain of doing good and that you will join us in the endless e struggle against poverty. God bless and save all Serbian families with many children and our honored donors who participate in the noble effort to return smile on children faces. www.serbsforserbs.org 2012 • our donors are satisfied with the activities and they are ready to help other families; • our organization is satisfied with the results; • family is ready in the future to become our donor and if necessary help other families that are in need of help. Our mission The mission of Charity organization Serbs for Serbs is to affect on consciousness of Serbian people through our projects and humanitarian activities, in order to develop better society for future generations. Why Serbs for Serbs? We wanted to alleviate impaired spirit of Serbian people in togetherness and brotherhood help through humanitarian work and social aid. Charity organization Serbs for Serbs, in the cooperation with the branch in USA, conducted the first part of the great action of helping the 11-member family Ljiljak from the village Neuzine near Zrenjanin. This family was expelled in the action Storm from the Serbian Krajina, and after several difficult years of refugee life on Kosovo and Metohija, it has finally found its home in the small village in Banat. The representatives of our organization from Belgrade and Novi Sad visited family Ljiljak at the end of March. www.serbsforserbs.org 2012 That was the first part of the help we provided for the Ljiljak family. During the visit, we agreed to get them the appliances every household needs: chairs, closets, beds... We will also try to help them in building the stable and setting the greenhouse in their yard. Our members from Novi Sad brought the books of Orthodox thematic for the youngest, who were happy to get them. The help we provided consists of: • refrigerator • wood-burning stove • electric stove • freezer Total value of the help was 80,496 dinars. We promised the family to come again soon, with additional help. The appeals for help that the Charity organization Serbs for Serbs is getting each day are numerous. Although our organization tries to respond to the growing number of requests, unfortunately it is not possible. But, we won't give up! The organization has provided charity help to the six-member family Lazarević from Valjevo, in total amount of 22,000 dinars, for paying the costs around the house. We hope that we have made life for this family a bit easier, and partly helped in resolving urgent problems. The state of the house of family Lazarević is very bad. In March we conducted another action in a row in the area of Kozara. This time we helped the war veteran Branislav Grahovac and his family, who live in the village Lamovita near Prijedor. The family consists of Branislav, his wife Dragica, a son Njegoš and daughters Adrijana and Stanislava. Both daughters are married, but their financial situation is difficult, because their husbands are not permanently employed. Branislav asked us to help him, because they have sold almost everything they had, and now they are in a difficult position. Charity organization Serbs for Serbs set aside the first rate in the amount of 2,000 EUR into the special fund for building a house to the Balović family from the village Rajetiće in the Raška area. This six-member family should get a new family home next to the old, ruined house in which they live at the moment. Father of the family is having a brain tumor, while the mother has constant epileptic attacks. Although our organization is concentrated on helping families with many children, we decided to help Branislav, after having realized what kind of person he is. Branislav was a soldier since 1974 until 1999, when the Army of Yugoslavia dismissed him, and he has been unemployed since. He spent the war in Slovenia, Croatia and B&H. During the war, Branislav's pancir has been hit 17 times. We should mention that family Grahovac has helped several families from Republic Serbian Krajina after the operation Storm. Dragica used to work as a cook, but she had to stop due to health problems. The bigest problem of the family was a debt for the electricity which they couldn't pay, so we decided to pay the debt and also the services of the lawyer, in the total amount of 871,60 KM. Branislav promised he would keep paying the bills. We want to express the thank to all the donors of the organization from family Grahovac! www.serbsforserbs.org 2012 Our organization was the first to start cleaning the inner side of the church together with the pupils from elementary school, who are future members of SfS. All the pupils gave their active contribution. Before we started, we prayed to the resurrected God that this Temple is completed and serve its purpose. After that we classified the remaining construction material in order to protect it from further decline. On Friday, April 6, in the municipality Pale, we conducted the action of removing the construction waste from the location of the Temple (which is being built), in the memory of the victims of Russian nationality in the last homeland war in Bosnia and Herzegovina. Building of the Temple commenced 10 years ago, but due to the lack of will and material means, the works were stopped in 2007. Several weeks ago we received an information that the local community wants to collect the money for the continuance of work. We were actively involved in noticing the competent authorities in order to realize this idea. www.serbsforserbs.org 2012 In the previous action, we provided the material for equiping the bathroom. Charity organization Serbs for Serbs helped the sevenmember family Ĺ alipur from Priboj. Considering the fact that the family lives in the area of great moisture all year long, they have problems with mold in inner walls of the family house. Our organization has had the opportunity to help this hard working family before, but this time we decided to get them the material for the isolation of the house, in the amount of 110,250 dinars. We hope that this donation will resolve their problems, and make their life easier. Part of the help, which the Charity organization Serbs for Serbs provided together with its donors within the great Christmas action, was delivered during March to the Serbian families in Novo Brdo, Vitina and the Gnjilane municipality (Kosovo and Metohija). The help was sucessfully delivered thanks to our friends from the Charity organization Mother of nine JugoviÄ&#x2021;, and we express immense thank to them! The action continues! Serbian club New York from USA, in cooperation with the Charity organization Serbs for Serbs, has succesfully commenced the realization of the project of building a house for the family Tanasijević from the municipality Štrpce, in the southern Serbian province Kosovo and Metohija. The first phase of the project consists of the building a bathroom within the house, in the amount of 117,500 dinars. Serbian club New York donated 1,105 dollars, and the organization Serbs for Serbs the rest of the money. We also delivered help to the family ðorñević from Štrpce – laminate, for the house which is being built. That was the second part of the help to the family ðorñević from the Christmas action of our organization which was conducted on Kosovo and Metohija. The representatives of the Charity organization Serbs for Serbs from Belgrade attended the sanctification of the icons of Saint Sava in the Russian church in Belgrade. Our friends from the International public fund of the unity of Orthodox nations donated 30 icons to SfS. We prepared the icons for the families on Kosovo and Metohija and in Krajina, whom we visited in the scope of the traditional Resurrection action. The very first Serbs for Serbs fundraiser on West Coast was held on Saturday, April 21 in Los Angeles, California. Tickets were $25/person and included open bar, silent auction and live entertainment. Each donor also received a bracelet that stated “I made a difference”, implying that each $25 ticket they paid will make a difference in the lives of impoverished families. Raffle tickets were also sold for $10 a piece at the admission. Close to 100 people attended this event and together we raised net $5,000. Silent auction included items such as celebrity jewelry, IPAD3, Garmin GPS, professional headphones, balloon ride and eclectic painting. Raffle ticket prizes were various gift certificates from hair salons, skin treatments, shopping and professional services. Except for the painting and balloon ride, all items were sold for either full retail value or above. IPAD 3 was the most popular item at the auction and was sold for $650. Thanks to all the sponsors who donated for the silent auction and raffle we were able to raise almost half the money this way. The fundraiser was funded and organized by Suzana Tizabi, Nenad Djokic and Jasmina Aleksic. There were 16 sponsors who donated funds, their products and services for the silent auction and raffle.Additionally, 12 volunteers worked as bartenders, bar backs, security and cashiers to ensure that all donors have a great time. Live entertainment was provided by Milan Vidovic, a Serbian entertainer and producer, and music included Serbian pop and rock hits such as “Moji su Drugovi” as well as American rock classics causing quite a quake on a dance floor. Tizabi (Floyd Associates, Universal Detection Technology), Natalie Saraf (Makeup by Natalie Saraf). Organizers spoke briefly about the most urgent projects and goal of $10,000 that is needed to fund humanitarian actions for 11 families in the month of May. Then, the video presentation was shown on the projector and many people got teary eyed while watching it. In the end, Jasmina asked all donors to proudly raise their hands and show off their bracelets because they have made a difference by donating to such an important cause and a great charity. Thank you ALL for support, and see you again soon! www.serbsforserbs.org 2012 event, we all made small difference and helped some of those kids. The lounge La Pomme was at full capacity around 8PM with many of new faces that haven’t heard about our organization before, which was our main goal of the night to spread the awareness. Everyone had a great time socializing and dancing throughout the evening. Our special guest of the night was Milos Djordjevic from Chicago who created a great and unforgettable atmosphere. Let’s not forget all the volunteers that supported this event: photo/camera services from Goran Veljic (www.photovideowizards.com), La Pomme lounge (www.lapommenyc.com), Father Djokan Majstorovic from Serbian Orthodox Cathedral of Saint Sava in NY (www.stsavanyc.org), Serbian Consulate in NY (www.serbiaconsulatenyc.com), performer Milos Djordjevic (www.milosdjordjevic.com) and many others. Thank you all! Overall the event was great achievement of all the people that donated money and their time that night. This was the first party in NY and we are sure that many more will come. Please do not forget how many impoverished Serbian kids need our help and support. Funds raised during this event will improve living condition of Serbian kids in need, but we cannot stop here because so many kids live in poverty and without basic living conditions. 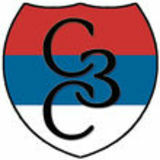 Please keep donating via our website to improve lives of Serbian children. ALL TOGETHER! FUTURE! Number of donors in 2012. Serbs for Serbs Report April 2012.